Symptom: None of the lights working. 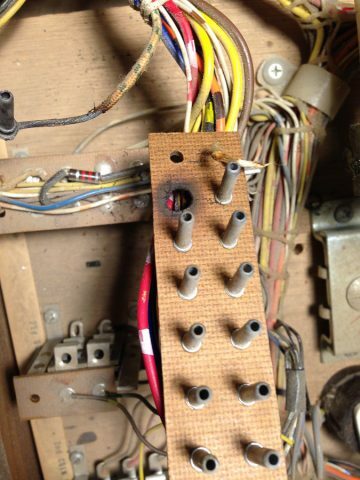 One of the most common repairs I do is related to burnt connectors for the lights on a pinball machine. Most of them are on solid state machines built by Williams and Data East. But even an EM machine can have this problem. Burnt lighting connector from Bally EM pinball machine. Unlike the newer machines where new connectors can be installed, the old ones require a work-around. In this case, the connector was between the control board plywood with all of the relays mounted on it and the fuse block on the right side of the cabinet near the tilt mechanism. This is a little used connector which would only be used if one were removing the control board from the pinball machine, which is pretty rare. Most EM pinball machines don’t even have this connector, so I had no problem just splicing the bad wire together and bypassing the connector. Had it been a connector for removing the backbox or playfield, I probably would have installed a single pin Molex connector or something similar for the bad wire. Since the lights on this machine hadn’t worked in years, there were a few tune-up related items that needed to be done, such has replacing burned out bulbs and cleaning some relay and stepper contacts to get all of the lights working again. This entry was posted in Pinball, Repairs and tagged Bally, connectors, EM, lights by Randy. Bookmark the permalink.